John Kesecker is a 58-year-old man who is very ill and desperately needs a kidney transplant. In 2008, John underwent surgery for a liver transplant after being on the waiting list for many years. His liver is healthy and thriving but now he finds himself in the final stages of kidney failure. The good news is that his step-daughter, Tonya Ramsey (seen in this picture with John) is a match and will be John’s donor. John has been through many health-related issues since 2008 unrelated to his liver transplant. He suffered with a hernia, had two knee replacement surgeries and was in and out of the hospital fighting pneumonia and low blood counts. But against all odds he is still alive and fighting for his life. While John is so grateful that, after everything, he is still here, he faces yet another challenge. Transplants are life-saving but financially draining. Though John has Medicare, it pays just 80%; the other 20% must be paid out-of-pocket. Before his team of medical professionals from the University of Maryland will list him, he needs to raise enough money to cover these costs that also include travel to and from doctor visits for check-ups for both his liver and for his kidney, relocation closer to the center at the time of transplant, and anti-rejection medication he will need to take post-transplant for the rest of his life. That expense alone is astronomical. His only income is social security as I am his caregiver 24/7. This is a challenge he cannot face alone. John needs your help! To help with the financial burden of John’s uninsured expenses, a fundraising campaign in his honor has been established with HelpHOPELive, a trusted nonprofit organization that has been providing community-based fundraising guidance to patients and their families for more than 30 years. All donations are tax-deductible, are held by HelpHOPELive in the Mid-Atlantic Kidney Transplant Fund, and are administered by HelpHOPELive for transplant-related expenses only. Please consider a contribution. Thank you for your time, prayers and support. Please keep an eye on John’s webpage because we will be planning some fundraising soon. On April 16 th John was admitted to Universty Of Md. 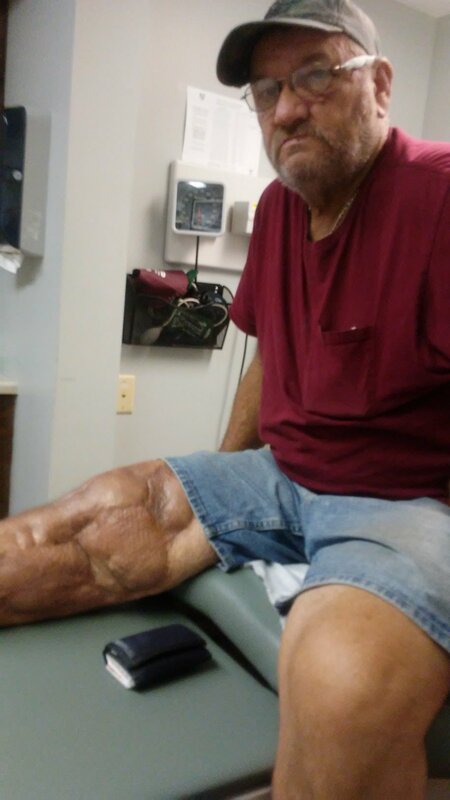 To Have right leg amputated ,do to infection in the bone in the right leg .If he don’t have amputation wont be able to get kidney transplant because of infection may get into blood stream,4 days after amputation John aspirated into his lungs almost lost him ,was on respirator for 2 and 1/2 weeks. He was in hospt 36 days .Rehab now closer to home for 20 days,then home on June 8th for home rehab.He has a long rd ahead of him your thoughts prayers are a blessing,ty His Wife. My husband has been on dialysis every night at home since Nov. We do one day at a time, till transplant comes.